My dear baby Apolline, this story is yours. When the moment to become a mother on your own will come, I hope that my story, the story of your birth, will give you strength and encouragement. Be courageous and take advantage of this special moment that is the birth of a child. On Friday, June 19, the expected date of delivery was exceeded by 1 day, I have an appointment with Dr. Paul, my ObGyn. The exam is going well, you still benefit very well of being inside my belly : 3.9 kg! Dr. Paul tells me he wants to see me on next Monday if nothing happens by then. For him, everything is settling, it is for soon! Fortunately because I have more and more trouble sitting, I have small pains in the lower back: walking makes me feel good, even if it is at the speed of a snail! It must be said that for 15 days, I only do that, walking! I walked all the streets around and into KLCC and Pavilion hoping it helps you to go down…. On Saturday, June 20th, we head for the airport in the afternoon to welcome your grandmother. 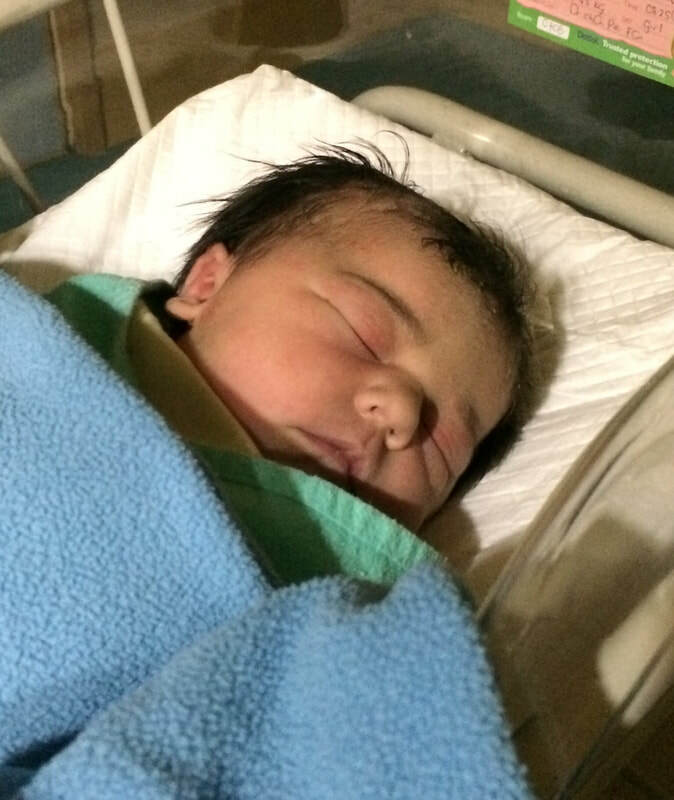 She hoped there was no one to welcome her, which meant I was in the hospital to give birth! Your daddy drops us off at the hotel where your grandma will stay during the week. She's all excited! She brought me a lot of little sweets... I am pleased to know she is here. After a little walk, we meet your dad and Xavier, a friend. We do some groceries to prepare the evening barbecue. I'm a little tired but nothing more. The evening goes well, we enjoy the mild temperature outside. For the next day, I plan to go walking with your grandmother to show her the various places where she can come to walk and go shopping quietly. We leave at the end of the morning, the walk is nice, we chat a lot. I try to show her a lot of things so she can feel comfortable when she finds herself alone. We go around several shops in Pavilion, I show her the little clothes that we have spotted for the wedding of your aunt and uncle. I am a little tired of walking so we decide to go and buy a fresh juice. It does me a lot of good! Before returning back home, we decide to do some food shopping: I want apricots! We go back home walking, quietly. I feel more waves than usual. We are back at the apartment around 4pm. The waves are there: would the great moment have arrived? They seem to be intense and they come back very regularly. Around 5:30 pm I send a message to Nadine: "I think something is happening! I think I will go to Pantai...." She encouraged me breathing and do the rainbow relaxation… I feel relaxed. Back at home, we go for a little dinner. I sit down on my gym ball and gently roll my hips: it feels good, I feel like helping you find your way. After dinner, I leave to lie down in our room. I lay down on the side, the pregnancy cushion between the legs. Your dad prepares a bath to relax and help me to settle there. That feels good. I continue to breath deeply during the waves. Your dad caresses my hair tenderly to help me to relax. It makes me feel good to know he is by my side. Towards midnight, the waves are intense, I suggest to your dad to go back to the hospital, I would not risk to give birth in the car! At the hospital, we make the same path but this time I need to hang on your dad's neck to manage the waves...Arriving at the maternity ward, I am asked to sit on the bed to do the monitoring. The midwife asked me if I want to get VE: I am at 0.5 cm! I thought that the waves were already intense. We decide to go home again. Arrived at the residence, around 1am, we walked around the pool... 10 steps, a contraction, I hang on your dad's neck, I breathe deeply, I swing the hips. It passes, another 10 steps....I lay down on the bed. At each waves, I kneel, I swing the hips. The waves are increasingly intense. At some point I realize that I have to let go, that I have to go with the waves rather than restrain myself so that they are less intense. I let myself go, I breathe deeply every time waves hug me. I try to work in the same direction as my body and it feels good! Things are moving, I can feel it ... Several times, I go to the bathroom. I have the impression that there is a very small amount of liquid leaking. Your daddy is always near me, half-asleep, which does not prevent him from massaging my back every time I ask him. I feel him strong by my side and not too worried, it helps me. He asks me if we should not go to the hospital. I reply that I want to wait a little longer. Around 6:30 we will leave. I am afraid that the work has not advanced that much. We leave the apartment around 6:45. It is very difficult for me to sit down, the contractions are intense. At one point I feel like something is releasing and a quantity of liquid flow. I believe I have lost the waters! We arrive at the hospital, your dad drops me in front of the entrance and leaves to park ... I go quickly to the maternity ward and warn the nurses that I have lost the waters. Again: I lay down on the bed. It's untenable, I have to put myself on the side. I keep asking to go into the tub. The midwife examines me: the moment is there! After a quick moment I go into the water, it feels so good. I am in my bubble.. Your dad is near me, his hand on my head. I want to push, it's irresistible. Nadine comes in and sits down on the other side of my head. The atmosphere is relaxed, I feel good. I have no idea about how long I am in the water. At each waves, I smile because I know you'll be there soon. At some point, I need to know how you progress : your little head is there, I feel your hair! I push harder and then you are here! Dr Paul (or the nurses?) put you on me, your dad kisses me. I do not realize ...Boy or girl ? We wonder and have a look : baby girl ! Thank you so much to Nadine, who has been such a great support just by being by my side. She helps me to feel strong and have confidence in myself. Thank you to Dr Paul and the Nurses at Pantai Bangsar for respecting my wishes!